Hello, Agents of A.R.K.! As we continue our fight against the evil RAXXON GLOBAL, we must expand our operation and enlist more Agents in the battle. Today, we'll be taking a closer look at the four new Agents that will be joining A.R.K. and evading the Hunters of RAXXON. First off, let's introduce the Mantis. A strong believer that the best defense is a strong offense, the Matis has the awesome Blade Strike, which can be used to stun Hunters at the cost of being seen. Agents will need to decide when to use this ability for maximum effect. 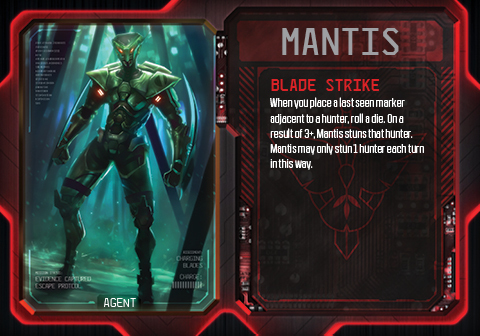 The Matis also has access to the Pulse Blades equipment card, which can instead stun all Hunters adjacent to the last seen token. Neutralizing threats is the name of the game when the Mantis is involved. Next, let's take a look at the Panther. 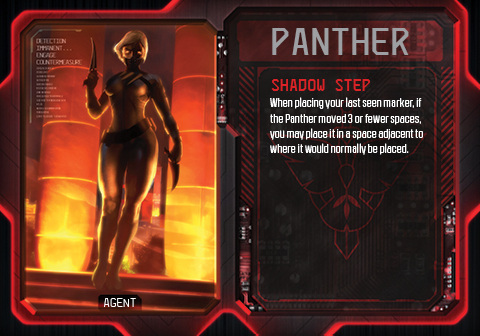 The Shadow Step ability allows the Panther to confuse even the most clever Hunters by manipulating the last seen token to obscure her trail. The Hunters will have to test their deduction skills to determine just where the Panther is really moving to. Additionally, the Panther has access to the Smoke Dagger equipment card, which can be revealed to stop the vision of a Hunter within 4 spaces of the panther. It will be very tough for Hunters to determine where the Panther is heading, and even tougher to stop her. The Raven might seem like a simple operative at first, but his ability has the potential to be one of the strongest in A.R.K. 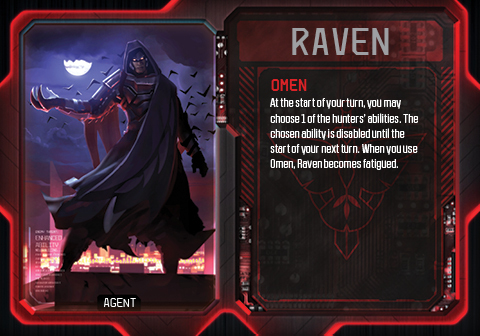 The Omen ability allows the Raven to completely disable the ability of a Hunter for a turn, which can be a devastating blow to RAXXON's forces. Using this ability will give the Raven a fatigue token, though, so Agents will need to be smart about when it's activated. The Raven also has access to the Mind Trap equipment card, which forces hunters to reveal where they plan to move on the next turn. This allows the Raven to be where his enemies are not. Why rely on deception and centrifuge when you can simply outrun your enemies? The Fox's ability allows her to move 5 spaces instead of 4 and become fatigued. This can give her a strong leg up on the Hunters, moving fast enough to outrun them and get away. 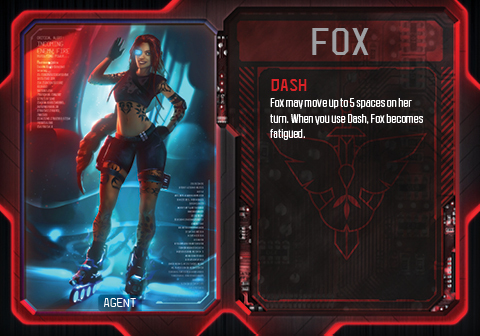 The Fox also has access to the Remote Trigger equipment card, which allows her to score an objective a turn after she normally would, which can certainly throw off the Hunters and their strategy. If you can outrun the competition, it won't matter if you're hidden or in plain sight. That's all for now, Agents! Be sure to check out last week's preview on the Hunters of RAXXON, and remember that Specter Ops: Broken Covenant will be available from retailers and our own webstore soon!